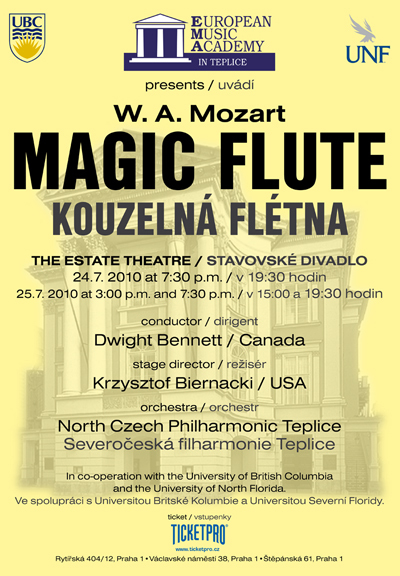 The University of North Florida Opera Ensemble is scheduled to perform The Magic Flute by W. A. Mozart at the European Music Academy in Czech Republic in the summer 2010. 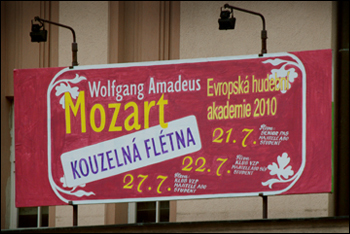 Performances are booked at the Estates Theater (“Mozart’s Theater”) in Prague and City Theater in Teplice. Check back soon for a full photo blog of the three-week tour! 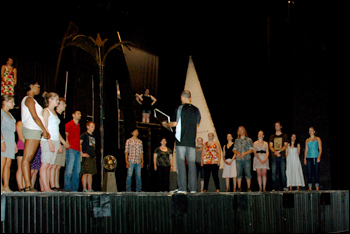 The UNF Opera Ensemble departed from Jacksonville, FL on July 5, 2010 on their journey to the Czech Republic. 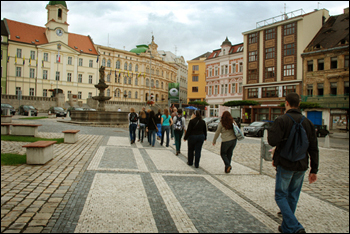 After flying to Atlanta, GA, and connecting to a non-stop 9-hour long flight directly to the city of Praha (Prague), the students boarded a bus for Teplice. 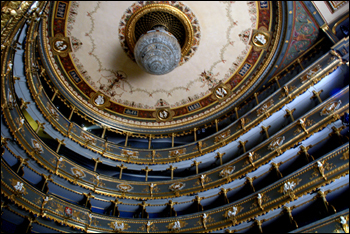 After checking into the hotel, ensemble director, Dr. Krzysztof Biernacki wasted no time in taking the students on a quick tour of the local shopping areas and, of course, the singers initial initiation to the local opera house. 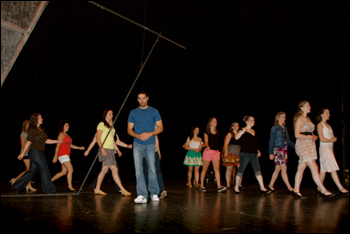 The ensemble begins rehearsals July 7, 2010. 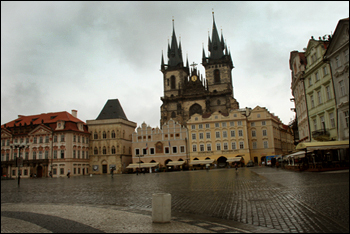 The tour includes performances in Teplice and Prague in the Czech Republic and a one-day walking tour of Dresden, Germany. 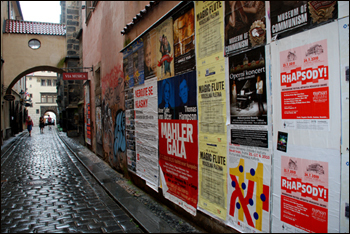 Check back to this blog for daily updates, images, and news from the UNF Opera Enseble’s tour of the Czech Republic. For questions about the tour, contact the University of North Florida Department of Music, or Ensemble Director Dr. Krzysztof Biernacki at kbiernac@unf.edu. This morning the UNF Opera Ensemble gathered at 8:00 a.m. for its first meet-and-greet with their co-cast (opera students from Vancouver, Canada) and were introduced to European Music Academy Program Director Norbert Baxa and Maestro Dwight Bennett. After a four-hour introductory rehearsal, and a quick lunch at the local town square, the students began learning (and rehearsing) the staging for their upcoming performances of “The Magic Flute” by W. A. Mozart. Check back to this blog every Friday for news from each week’s travels, rehearsals, and performances! Remember to check back to this blog every Friday for a full online gallery with full images from each week’s travels, rehearsals, and performances! Today was an exciting day for the students as it was their first opportunity to rehearse with the North Czech Philharmonic Teplice in preparation for their Sunday evening concert. Both University of North Florida and University of British Columbia students will be featured. 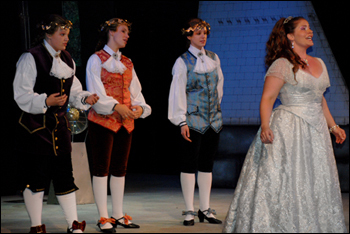 UNF Opera Ensemble students are featured in the chorus with solo performances by members Amanda Finch, Brittany Fouché, and Angelique Perretta. Today is the day! Click on this link to view photos from the past week’s activities. After a long week of rehearsals and today’s continued preparations for upcoming performances, the students attended “La Boheme” to support the UBC student cast. The opera was followed by a reception with special guests including the Canadian Ambassador Valerie Raymond and her husband Major-General Tom de Faye. Check here for full images from the event! 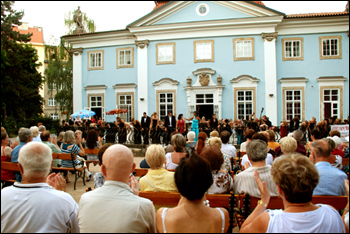 Today the UNF and UBC students performed works by Dvorak, Verdi, Puccini, Lehar, and J. Strauss at the Garden House in Teplice. 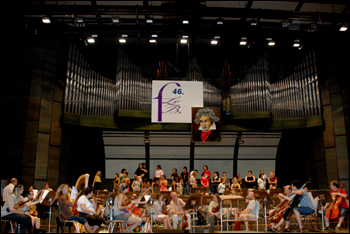 This concert was performed in front of a full audience and very well received. For full images, please see our gallery. Today the students were introduced to the five student conductors and continued rehearsals. 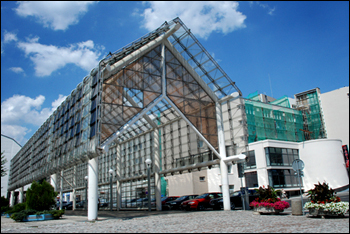 The temperature in Teplice is HOT, HOT, HOT! Students walk each day from the sports complex to the opera house (as well as to lunch and dinner locations) so they are getting great exercise and a chance to explore the city. Today the students got their first look at the set well under construction. 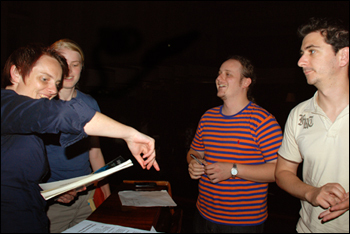 They also continued rehearsals with the guest student conductors as well as with the symphony. Click here to view a gallery from today’s rehearsal. 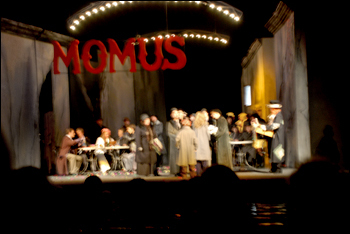 Each group of students continued working with either staging or the orchestra in the weeks leading up to the opening performance. New images from today’s practice and the opera house and symphony hall can be viewed on our gallery. Our video files added were removed because frankly they loaded way too slow for anyone to actually view them! We are hard at work on a video page featuring practices and past performances. Look for the page URL before the week is over! It will be worth the wait. Check out our first VIDEO featuring UNF student soloists Amanda Finch and Brittany Fouché with UBC student soloist Adrian Glaubert. Thanks for your support of our students. The students continued rehearsals and for the first time in costume! They were given an inside look into the costume department’s plans for the performances. 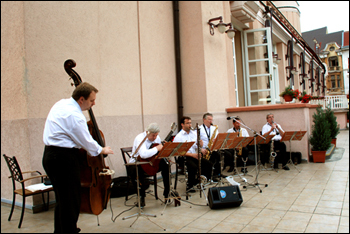 Additionally, both the UNF and UBC groups performed for the second time at the Garden House in Teplice conducted by Dwight Bennett. 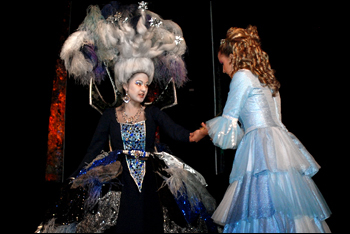 Students performed selections from “The Magic Flute” as a preview to their main performances. Click here to view the updated gallery! If you have been following this blog, then you already know how hard the UNF and UBC students have been working. Now you can see it! Dr. Krzysztof Biernacki’s Vimeo website. If you don’t see yourself, or your student, don’t worry! UNF Department of Music’s Director of Public Relations, Ashley Earles-Bennett, is uploading clips daily, so check the site often for more clips! Today the students woke up to a booming thunderstorm. With the rain came a cool breeze that was super welcome after the long heatwave experienced over the past two weeks. After a long, long, long day of rehearsals, the students were treated to a celebration of several birthdays (cast members and faculty members) with food, music, and dancing. Look for the full photo gallery Sunday! 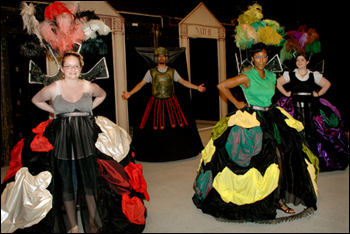 Today “Cast C” completed their first successful run through of “The Magic Flute” in full costume. Check out the full gallery now! Today “Cast A” and “Cast B” completed their first successful run throughs of “The Magic Flute” (with this production) in full costume and with hair and makeup. Today “Cast C” completed their first successful run through of The Magic Flute in full costume and with hair and makeup. 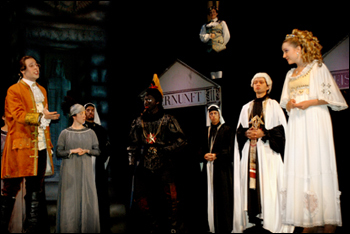 Tonight “Cast A” performed the opening night performance of The Magic Flute, to great acclaim, in Teplice. 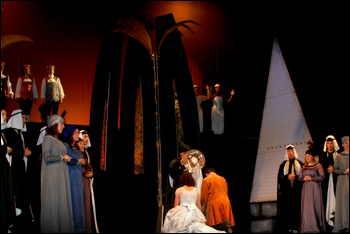 Tonight “Cast B” completed their first successful performance of The Magic Flute (with this production). Look for a video link soon. After eighteen days of rehearsals and a couple performances under their belt, the UNF Opera Ensemble and the UBC cast members were finally given a full day off to relax. Today the students took a day trip to Prague where they settled into the city with a 2-hour bus tour and later a complete day of exploration of restaurants, museums, local shops, and more. Despite a long day of rain, the students had a wonderful trip. Check our gallery soon for images from the trip. Tonight “Cast A” performed in the historic Estates Theatr where Amadeus Mozart conducted his world premiere of “Don Giovanni” in 1787! Full gallery and video links coming this week. Check back! Tonight “Cast B” and “Cast C” performed in the historic Estates Theatre in Prague. Check back Tuesday for a full gallery and video links! After two great performances in one day by “Cast C” and “Cast B” the students were given a 2nd day off to explore Prague. View a gallery of their adventures now! Video clips from performances coming Tuesday. 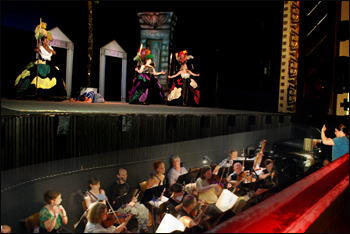 Tonight the performance of “Cast C” completes the UNF Opera Ensemble’s first successful tour of “The Magic Flute” in the Czech Republic. Video clips from performances are now available! With the tour officially over, the students spent their last day in Europe exploring Dresden, Germany. Look for images and video clips from the entire tour within the next couple of weeks! After a long flight, the students all made it back safe and sound to Jacksonville!